Brothers Lorenzo and Frank III Fertitta, sons of retired casino magnate Frank Fetitta Jr., have recently gifted the NYU Stern School of Business with a generous $15 million endowment for the newly established Fertitta Veterans Program. The donation will assist the full-time acceptance of around 20 military veterans looking to pursue an MBA, reducing tuition to a flat $30,000 per year. 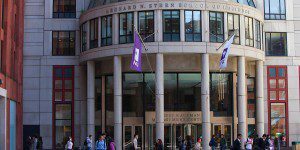 The current tuition rate for the NYU Stern MBA program is just above $66,000 per year. The program will not only provide a significantly reduced tuition rate, but will also provide courses to spearhead MBA students into their future business careers. The effort to naturally integrate returning military veterans is not just limited to the school, says Raghu Sundaram, vice dean of MBA programs. The scholarship will officially go into effect in 2017. The Fertitta brothers both work in the casino and sports entertainment industry. Frank III, who earned a BA/BS from the USC Marshall School of Business, is the current CEO of Station Casinos, which was originally founded by his father. He is also a part-owner of Zuffa LLC, the company that owns the UFC, of which Lorenzo works for. Lorenzo graduated with an MBA from NYU Stern in 1993. Click here for more information on the NYU Stern Fertitta Veterans Program.